Stephanie Clergé knows how it feels to be in transition. 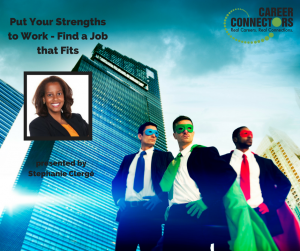 Throughout her career, she has worked in large and small organizations including Cisco, Deloitte, BMO Harris Bank and Chandler Unified School District. She is now the Director of Training and Consulting at Kolbe Corp, an HR consulting firm specializing in increasing individual and collective performance. Those who know themselves and focus on their strengths are 6x as likely to be successful in their roles, and 3x more likely to say they have a high quality of life. Try this interesting exercise. Write your signature on a piece of paper with your dominant hand. How did that feel? Easy, natural, comfortable, fast and legible were some of the comments in the room. Now write your signature with your non-dominant hand. That signature felt hard, uncomfortable and slow, right? Finding your strengths should be like writing with your dominant hand. Do what comes naturally and gives you energy. Sometimes you have to look for talent in unexpected places, so be aware of your underlying patterns of thought, feeling and behaviors. Identify what task, team, manager, culture, industry, or other experience you loved. Also, take a look at your non-work and work-adjacent activities such as volunteering, clubs, organizations and hobbies. These activities can shine a light on what energizes you. Your LinkedIn profile should have a clear, concise headline and the summary should show a bit of your personality. Have well-written recommendations from the right people, and be part of relevant groups and companies. Take a critical look at your page from a recruiter’s lens. Does it tell your story? Connect with your network too. You should be interested and interesting when connecting. Be able to clearly tell your work history story. You never know when you might connect with someone who can help you in your next step. Your homework is to create at least one Strengths Statement. Pick a strength that really describes you. Think of a task that really energizes you. And then create a sentence with key elements of your talent contribution that you use to complete the task. For example, Stephanie says, “My strength is reviewing documentation (data processes, presentations) written to influence others and providing guidance to make it more compelling.” You should be able to clearly communicate your contributions to interviewers. You want to have a plan that is SMART. Follow up with former colleagues, managers for recommendations. Attend one event a week. Apply to ten positions a week – not quantity, but quality! Call your accountability partner . They are on the journey with you and providing emotional support. Every career span is different. Today people are in jobs about two years. You have the opportunity to reinvent yourself each time you transition. No road is easy, but your strengths help you do it with ease. Stephanie was kind enough to make her slides available on her website here. Should you use Twitter to find a job? Use Twitter if you’re good at it. You need to invest your time wisely. Also Google yourself to see what’s out there about you. What is one key thing to share with a negative person who is stuck? Be honest. If that person is negative with you, it’s coming across to other people as well, including job interviewers. Find that source of inspiration and make it part of your journey. Stay balanced to get rid of negativity. Do you have advice to follow up on online submissions? Only follow up if it’s the perfect job. Otherwise don’t waste your time. Remember to always invest your time wisely. Chances are your connected devices have an Intel processor in them. Intel is going from a PC to a data-centric company that relies on their people. This company hires “niche” applicants so be sure to do your homework on the company! In addition to the usual company benefits of stock purchase plan and 401K, employees receive a sabbatical. For every 7 years with the company, the employee gets 8 consecutive weeks off, or every 4 years with the company gets 4 weeks off. Job openings can be found at www.intel.com/job. The company with Good Hands, Allstate has been in business more than 85 years. There are 1,500 regional company employees, and 700+ small business owners, with a local office in Tempe. Allstate insures 47 products, including auto, home, life and renter’s insurance. To be an agency owner, you should have management/supervisory experience, be business-minded and like being your own boss. There are no franchise or royalty fees, so an agency owner is true small business ownership. There is a $6,000 referral bonus for candidates with supervisory/management experience so apply or recommend someone you know. To learn more about Allstate careers, go to www.allstate.com/careers. On Thursday, April 5, Abby Kohut will speak about “Networking for Introverts, Extroverts and In-Between Verts” at our new location at the Grand Canyon University Conference Center. Join us!